Number one in aramid technology. 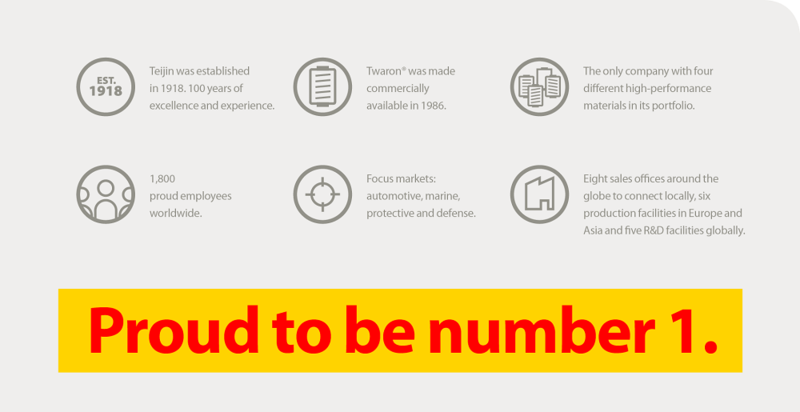 Each day, around the world, customers rely on Teijin Aramid for the world-class aramid solutions and support that only we can provide. It’s why we’re the industry leader: the world’s number one aramid producer with a near-50% market share. A company with customers in 74 countries, that has helped break records, send spacecraft to Mars, and drive progress in Formula One. But this is just the start. Together, we’ll drive progress even further. You can be sure of that. Whether in car tires, ballistic vests or firefighter garments, our technology is making a real difference to our customers and to people’s lives. By supporting stronger, lighter and more durable materials. And by enabling applications and end-products that protect, support and empower. Whatever your industry, whatever your objectives, our solutions will help you unlock new levels of performance. Solutions of tomorrow are available today. More than ever, the automotive industry is driving forward at relentless speed. And with consumer expectations growing and legislative standards rising, reliability is non-negotiable and performance is everything. We will go the full distance with you!